C&IT rounds up the best Christmas party venues across three different themes for 2015: Classic, Modern and Quirky. Roaring log fires and the sound of bagpipes will greet guests at Scottish castle hotel Atholl Palace this Christmas. The Highlands retreat is offering several party nights for groups of up to 300 people incorporating a cocktail and canape reception, three-course dinner and traditional Gaelic ceilidh until the wee small hours. Those who stay the night will also enjoy a hearty Scottish breakfast in the morning. Festive parties at the four-star Norton Park Hotel in Winchester will be given a Winter Wonderland experience complete with ice sculptures, white draping and dramatic up-lighting. Guests can join one of the shared party nights or enjoy their own private gathering for up to 250 people. The package includes a three-course dinner followed by mince pies and music from the hotel's resident DJ. Historic London venue 8 Northumberland Avenue will be bringing the outside in with its Winter's Avenue-themed parties. The Old Billiard Room and adjoining annexe will be transformed into a traditional Bavarian market with food and drinks, including mulled wine and desserts served from the stalls. Twinkling lights and faux snow will help set the scene. Both dinner dance and reception options are available, accommodating 220 and 500 guests respectively. London's highest dedicated events venue Floor 42 is set to open at the The Leadenhall Building (also known at The Cheesegrater) this September in time for Christmas party season. Positioned almost 200m above street level, it will offer some of the best views of the capital lit up in all its festive glory and will have space for up to 300 guests for a reception, or 250 for a seated dinner. The classic Winter Wonderland theme will be given a modern spin at Manchester's Imperial War Museum North. The venue will be using its 360-degree, digital wallpaper technology to immerse guests in an Alpine setting simulating falling snow. It can hold up to 300 guests for a seated dinner or 700 for a bowl food reception. Clients also get their company logo projected on the Harrier Jump Jet as part of the package. Birmingham's International Convention Centre (ICC) has partnered with JD Parties to launch a Hollywood-themed Christmas package this year. Taking place across nine evenings in December, groups of up to 1,200 guests will experience the A-list treatment with a red-carpet arrival, pre-dinner entertainment, live show featuring songs and dances from Hollywood musicals, three-course dinner prepared by in-house catering team Amadeus, a disco and charity casino. Circus acts will dangle from the rafters of Manchester's lofty Victoria Warehouse as part of Smart Group's Urban Circus theme. Available as a shared or exclusive party night for eight to 900 people, guests will enjoy a cocktail reception with entertainment from fire-eaters and angle-grinders creating sparks; a two-course dinner and show; interactive dessert stalls; and an after-party where revellers will be invited to try out some circus-themed activities themselves. 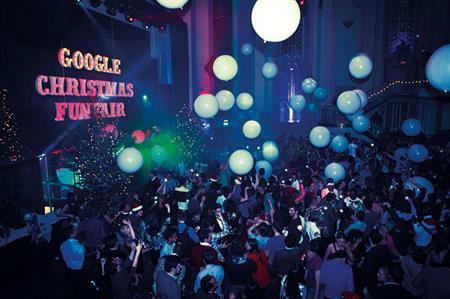 According to London venue Troxy, the sign of a successful Christmas party is a packed-out dance floor, so it has joined forces with three popular club nights to offer companies a good old-fashioned, festive boogie this year. Clients can choose from Ultimate Power's '80s anthems, Guilty Pleasures' cheesy pop tunes or Sink The Pink's flamboyant celebrations to form their exclusive party package for up to 800 guests seated or 1,500 standing. Gourmet caterer NinetyNine has been charged with creating the menus. Knowsley Safari Park will become the lost world of Atlantis for Best Parties Ever's 'Party Under the Sea' package. Drinks and canapes will be served on board HMS Neptune, before a big reveal unveils an underwater dining-room with columns of bubbles, coral reefs and tropical fish. Aqua-themed entertainment, a four-course dinner, dodgems, a casino, live music, a disco and a pyrotechnic finale complete the line-up. Shared and exclusive options are available for up to 1,200 guests.